Tell the FDA to Warn Consumers about Antidepressants and Violence! Tell Congress to Protect Small Farmers and GMO Labeling Laws! Let Local Communities Control 5G Technology! ACC: Let Local Communities Control 5G Technology! Tell the USDA: Protect the Integrity of the "Product of USA" Label! ACC: Tell the USDA: Protect the Integrity of the "Product of USA" Label! Ask Congress to Investigate the IOM's Vitamin D Report! Ask Congress to Make ALL Drug Trial Info Publicly Available! Ask These Doctors to Explain Their DDC Nominations! Ask Your Congressional Representative to Support HR 3865! Ask Your Representative to Join Rep. Chaffetz's Letter to FDA! Ask the FDA to Warn Patients of SSRI Violence! Ask the House to Oppose the Food Safety Accountability Act of 2011! Support HR 4475, the Compassionate Freedom of Choice Act! Ask your legislators to support the Compassionate Freedom of Choice Act! Ban Mercury in High Fructose Corn Syrup! Tell Legislators Blocking Natural Health "No Thank You!" CDC: Check Vaccines for Glyphosate! Tell the FDA: Keep Your Hands Off Our LDTs! Laboratory-developed tests (LDTs)--inexpensive diagnostic tests for patients that are developed and performed by local labs--include standard tests but also new ones, genetic tests, tests for rare conditions, and even custom diagnostics. Tell Congress to Oppose the DARK Act! Reject So-called "Protect Interstate Commerce Act"! Tell Congress to Reject the So-called "Protect Interstate Commerce Act"! Tell Congress to Repeal the Ban on Incandescent Light Bulbs! Tell FDA and Congress to Review Natural Ebola Treatments Immediately! Tell NIH Why Publishing Trial Results is So Important! Compounded Drugs Are "Medically Necessary"
Tell Pharmacy Benefit Managers that Compounded Drugs Are "Medically Necessary"
Tell Your AG and the FTC to Investigate ConsumerLab.com! Tell Your Legislators to Vote No on #DiabetesMiseducation! Tell the FDA Not to Approve Genetically Modified Mosquitoes! Tell the FDA: No GM Mosquitoes! Protect Interstate Commerce for Compounders! Tell the FDA and Congress to Protect Interstate Commerce for Compounders! Redbook Should Not Include Dietary Ingredients! Tell the FDA that Redbook Should Not Include Dietary Ingredients! Tell the FDA to Protect Compounded Medicines! Tell the FDA to Remove the Monograph for Oxybenzone! Tell the FDA to Stop Censoring Scientific Info on Food Labels! Tell the FDA to Stop Trying to Halt Food and Supplement Research! Tell the FDA to Stop Trying to Turn Food into Drugs! Tell the NOSB to Protect Organic Foods from GMOs and BPA! Tell the National Vaccine Advisory Committee to Listen to Parents about Vaccines! Tell the Patent and Trademark Office to Keep Natural Substances from Being Patented! Tell the USDA to Uphold the Integrity of Organic Standards! Revise New "Hazardous Drugs" Rule! Tell the USP to Revise Its New "Hazardous Drugs" Rule! Tell the Wall Street Journal to Disclose Medical Conflicts of Interest! DISASTROUS SEN. DURBIN ANTI-SUPPLEMENT AMENDMENT DEFEATED - SAY THANKS! Defend Your Access to Compounded Medications! Tell Congress We Have a Right to Know What's In Our Food! EPA: Revoke Approval of Atrazine! Extend the NDI Comment Period! FDA: Hands Off Doctor-Supervised Prescription Chelation for Heart Health! FDA: Tell the Public About Blue Light! FDA: Warn Consumers About Acid Blockers! FTC: Do Not Approve the Monsanto/Bayer Merger! SAY NO to GMO - Reverse the Decision to Deregulate Roundup Ready Alfalfa and Sugarbeets! Tell Them to Reverse the Decision to Deregulate Roundup Ready Alfalfa and Sugarbeets! Tell Your Legislators: "We Want Raw Milk!" Federal: Tell Your Legislators: "We Want Raw Milk!" Tell FDA Not to Put Americans at Risk for Big Pharma's Monopoly! Help ANH-USA Save Customized, Natural Medicine! Help End the Government's Shameful Silence About Vitamin D--the Natural Way to Prevent and Treat Flu Including Swine Flu! Test AC2 alert description that shows up to constituents in some rare cases. Is Your State Medical Board in Bed with the FSMB? Legislation to Protect Your Right to Know About the Science Behind Supplements! Call on Congress to rein in the FDA's power grab. No Sewage In Our Food! No Taxpayer Dollars to Lobby for Monsanto! Please Ask FDA to Respond to Our Citizen Petition on BPA! Ask the FDA to ban BPA in children's dental devices. Please Tell Consumer Reports They're Reporting Only One Side of the Subject! Pledge to Boycott the Food Companies that Fought GMO Labeling! Protect Access to CBD Oil! Protect Access to Thyroid Treatments! Protect Consumers, Not Biotech Profits! Protect Freedom of Choice With Vaccination! Protect Supplement Access in Puerto Rico! Protect Your Right to Know about the Science Behind Supplements! Free Speech About Science Act - Protect Your Right to Know about the Science Behind Supplements! Remind the Senate HELP Committee: "Protect My Access to Compounded Medications!" Say "Thank You" These Food Companies for Supporting the Drive to Label GMOs! Say "Thank You" These Natural and Organic Food Companies for Supporting the Drive to Label GMOs! Tell the FDA that You Oppose The Drug Company Petition To Ban P5P, The Natural And Bio-available Form Of Vitamin B6! Stop IRS Abuse of Non-Profits! Stop the Criminalization of Doctors! Stop the FDA from Overstepping Its Authority--Again! Stop the Social Media Attack on Natural Health! Support the Federal Right to Try Bill! Tell "Natural" Food Companies to Stop Opposing GMO Labeling! Tell AAP to Reveal Their Donors! Tell All Your Elected Officials: NOT Labeling GMOs Will Hurt America Economically! Tell Congress How Important Health Coaches Are! Tell Congress NOT to Co-Sponsor the Voluntary GMO Labeling Bill! Tell Congress NOT to Repeal the COOL Law! Tell Congress Not to Support the Latest Sneak Attack on Supplements! Tell Congress You Have a Right to Know What's In Your Food! Tell Congress for Amendments to the New Food Safety Bill! Tell Congress that Antidepressants Cause Violent Behavior! Tell Congress that Supplements Are Not Drugs! Tell Congress to Amend the 21st Century Cures Bill BEFORE It's Introduced! Tell Congress to Close the Halliburton Loophole! Tell Congress to Close the Halliburton Loophole! Please write to your Congressional representative and your senators today and ask them to reintroduce legislation to require the disclosure of what chemicals are being used in fracking. Tell Congress to Expand "Eligible Medical Expenses" Coverage! Tell Congress to Include Supplement Coverage in Health Savings Accounts! Tell Congress to Investigate the FDA's Delay in Granting Compassionate Exemptions! Tell Congress to Keep Your Private Medical Information Truly Private! Tell Congress to Listen to the Science on Vaccine Safety! Tell Congress to Make TSA Get Rid of Cancer-Causing Airport Scanners! Tell Congress to Oppose Robert Califf as FDA Commissioner! Tell Congress to Protect Your Access to Vitamin B12! Tell Congress to Reject Federal Vaccine Mandates for Head Start! Tell Congress to Reject Vaccine Mandates! Tell Congress to Reject the Research Works Act! Tell Congress to Repeal the Sugar Program! Tell Congress to Restore Free Speech for Nutritional Supplement Companies! Tell Congress to Review Drug and Vaccine Adverse Event Reports Too! Tell Congress to Save the Honeybees! Tell Congress to Stop Bullying Supplement Retailers! Tell Congress to Stop Harming Children's Health with Wrong-Headed Milk Policies! Tell Congress to Stop Shielding Monsanto and Fix the Chemical Safety Bill! Tell Congress to Stop the AMA's Price-Fixing Scheme! Tell Congress to Support Rep. Slaughter's Preservation of Antibiotics for Medical Treatment Act! Tell Congress to Support the BPA Act! Tell Congress to Support the BoxerDeFazio GMO Labeling Bills! Tell Congress to Support the Compassionate Care Act! Tell Congress to Support the HSA Bill! Tell Congress to Support the Preservation of Antibiotics for Medical Treatment Act! Tell Congress to Vote NO on the Trans-Pacific Partnership! Tell Congress to Vote No on #DiabetesMiseducation! Tell Congress to stop letting drug companies extend patents by testing drugs on children! Tell Congress, the FDA, and the CDC: Make Vaccines Safer! Tell Congress: Change Sugar Labels! Tell Congress: Don't Throw Charities Under the Bus! Tell Congress: Let ALL Nutrition Professionals Get Reimbursed for Obesity Counseling! Tell Congress: Save CBD Oil! Tell Congressman Markey His New FDA Legislation is Unnecessary and Burdensome! Tell Decision-makers: Keep Monsanto Away from Our Produce! Tell FDA and Congress They Could Quickly Alleviate the Worldwide TB Pandemic! Tell FDA that Nanotechnology Must Not Be Used in Organic Food Production! Tell FDA that Organic Farmers Shouldn't Follow Their New Guidance on Eggs and Salmonella! Tell FDA to Focus on the REAL Food Safety Problems! Tell FDA to Halt Approval of Frankenfish! Tell FDA to Keep Labeling Artificial Sweeteners on Milk in School Lunches! Tell FDA to Withdraw Approval of Antibiotics in Animal Feed! Tell Federal Regulators that Kombucha Is Food, Not Liquor! Tell Food Companies You Know They're Working Behind the Scenes to Keep You from Knowing If Their Products Contain GMOs! Tell GlaxoSmithKline to Keep Their Hands Off Compounded Medicines! Tell Google Not to Game the System Against Natural Health! Tell Government Authorities to Block Monsanto's Power Grab! Tell HHS to Make Public the FDA's Warning about Dental Mercury! Tell HHS to Stop Its Smear Campaign Against Supplements! Tell HHS to Support the ABC Coding System! Tell Hawaii Lawmakers: We Want Raw Milk! Tell Legislators What a TRUE "21st Century Cures" Bill Should Contain! Tell Legislators to Preserve Freedom of Choice! Tell Mayor Bloomberg that Diet Sodas Aren't the Answer! Tell Medicare and Medicaid to Bring Back Armour Thyroid! Tell Medicare to Allow All Nutrition Specialists to Design Therapeutic Hospital Diets! Tell NIH to Fund Intravenous Vitamin C Studies! Tell NPR to Report BOTH Sides of the HPV Vaccine Debate! Tell Newsweek to Stop Publishing Sloppy, One-Sided Journalism! Tell PBS They've Missed the Mark--Again! Tell Pfizer to Remove Gluten From Their Thyroid Medication! Tell President Trump and Congress: Supplements Aren't Drugs! Tell President Trump: Approve the Farm Bill! Tell Senators to Protect Consumer Access to Quality Supplements! Tell Them to Reverse the Decision to Deregulate GE Bio-Fuel Corn, Roundup Ready Alfalfa and Sugarbeets! Tell Them to Reverse the Decision to Deregulate Bio-Fuel Corn, Roundup Ready Alfalfa and Sugarbeets! Tell Them: No Protecting Monsanto! Tell Time Magazine: Shame on You! Tell USA Today to Publish Dr. Burzynski's Rebuttal! Tell USDA We Won't Stand for "Agent Orange Ready" Seed! Tell USDA We Won't Stand for "Agent OrangeReady" Soybeans! Dow AgroScience has created a strain of soybean that has been genetically engineered to withstand an herbicide called 2,4-D, a known carcinogen and one of the two ingredients in the infamous Agent Orange. Please write to USDA and protest this plan. Tell USDA We Won't Stand for GMO Freeze-Resistant Eucalyptus! Tell USDA We Won't Stand for GMO Herbicide- and Insect-Resistant Maize! Tell USDA We Won't Stand for GMO Herbicide-Resistant Cotton! Tell USDA We Won't Stand for GMO Herbicide-Resistant Soybeans! Tell USDA We Won't Stand for GMO Insect-Resistant Soybeans! Tell USDA that Nanotechnology Has No Place in Organic Foods! Nanotechnology: New Threat to Organic Foods Nanotechnology has no place in organic food. Like genetic modification, it is the antithesis of the organic concept. Tell USDA to Keep Apples Natural! Tell USDA to Keep Raw, Organic Almonds Truly Raw! Tell USDA to Stop Protecting Monsanto and the Biotech Industry! Tell USDA to Uphold Grass-fed Meat Standards! Tell USDA's AC21 Committee that GMOs are not "Safe"! Tell USDA: Fix the GMO Labeling Rule! Tell Your Representative NOT to Co-sponsor the Vaccinate All Children Act! Tell Your Representative to Amend the Compounding Bill! Tell your representative to remove obstacles to democratic participation. Tell Your Representative to Strike the King Amendment from the Farm Bill! Tell Your Representative to Support Compassionate Use Bills! Tell Your Representative--No Canned and Processed Foods in the Fresh Fruit and Vegetable Program! Tell Your Senator to Support the Boxer-Markey Bill! Tell Your Senators that the Leading Medical Journal in America Is Calling for Mandatory GMO Labeling! Tell Your Senators to Amend or Vote NO on the Compounding Bill! Tell Your Senators to Block Robert Califf's Nomination as FDA Commissioner! Tell Your Senators to Call for a Full Investigation of the FDA's Pay-to-Play Scandal! Tell Your Senators to Oppose the DARK Act Rider! Tell Your Senators to Oppose the Leahy Amendment to the Farm Bill! Tell Your Senators to Reject the New GMO Labeling Bill! Tell Your Senators to Repeal the Monsanto Protection Act! Tell Your Senators to Support the Boxer-Markey Bill and Oppose the Vitter-Udall Bill! Tell Your Senators to Support the Raw Milk Amendment to the Farm Bill! Tell Your Senators to Support the Vitter Amendment! Tell Your Senators to Vote NO on Sen. Roberts' Voluntary GMO Labeling Bill! Tell Your Senators: "Protect My Access to Compounded Medications!" Tell Your State Attorney General Not to Join the Anti-Supplement Coalition! Tell Your State Legislature: Preserve Vaccine Choice! Tell Your State to Reject Federation of State Medical Board Legislation! Tell the AMA to Stop Censoring Free Speech! Tell the American Academy of Pediatrics: Stop Lobbying Against Vaccine Choice! Tell the American Society for Nutrition to Stop Pandering to the Junk Food Industry! Tell the Attorney General to Correct Her Misinformation about Dietary Supplements! Tell the CDC to Address Concerns about the Safety of Aluminum in Vaccines! Tell the CDC to Do More Research on Mumps and the Vaccine Schedule! Tell the EPA to Limit Big Pharma Drug Levels in Biosolids! Tell the EPA to Reconsider Its Approval of Glyphosate! Tell the EPA to Regulate Glyphosate! Tell the EPA to Stop Poisoning Our Children! Tell the EPA to Test the WHOLE Pesticide Formula! Tell the FCC and Congress: Warn the Public About MWR! Tell the FCC to Protect Net Neutrality! Tell the FDA Not to Eliminate Traditional Pharmacies! Tell the FDA They Have No Legal Authority to Regulate Medical Tests! Tell the FDA We Won't Stand for Their Hijacking of Stem Cell Therapies! Tell the FDA What YOU Need to See on Nutrition Labels! Tell the FDA and CDC to Request Further IOM Study of Vaccine AERs! Tell the FDA that CAFOs Cause Foodborne Illnesses, Not Artisanal Cheesemakers! Tell the FDA that Cherries--And Now Walnuts-- Are Not Illegal Drugs! Tell the FDA that Gluten and GMOs Are Allergenic Too! Tell the FDA that Homeopathic Products Are Safe, and Current Policies Are Working Perfectly! Tell the FDA that Laboratory-Developed Tests Should Not Be Regulated as Devices! Tell the FDA that Medical Foods Shouldn't Be Restricted! Tell the FDA that PRP Treatments Should Be Exempt from Regulation! Tell the FDA that St. John's Wort Shouldn't Be Hidden Behind the Counter! Tell the FDA to Add a Review of Triclosan to the FY Priorities Document! Tell the FDA to Allow Alternative Remedies to Fight Antibiotic Resistance! Tell the FDA to Ban Phthalates in Drugs! Tell the FDA to Ban Potassium Bromate from Baked Goods! Tell the FDA to Block the Release of Frankenmosquitoes in Florida! Tell the FDA to Comply with the Will of Congress! Tell the FDA to Drop Its Embargo Policy! Tell the FDA to Give Dying Patients Access to Potentially Life-Saving Treatment! Tell the FDA to Go After Wood Pulp in Parmesan Cheese! Tell the FDA to Implement its Trans Fat Ban Immediately! Tell the FDA to Inform Consumers of the Mercury in Dental Fillings! Tell the FDA to Issue a Correction on Dietary Supplements! Tell the FDA to Obey the Law and Hold Public Hearings! Tell the FDA to Preserve Consumer Access to AMP! Tell the FDA to Protect Access to EDTA Chelation! Tell the FDA to Protect Patients from Superbugs from Endoscopes! Tell the FDA to Recall Artificial Sweeteners! Tell the FDA to Reject Genetic Manipulation of Human Embryos! Tell the FDA to Reject the DRV for Added Sugars! Tell the FDA to Reject the Panel's Advice on Avandia! Tell the FDA to Reverse Its Approval of SSRIs for Hot Flashes! Tell the FDA to Reverse Their Ban on These Important Ingredients! Tell the FDA to Revise Their New Supplement Labeling Standards! Tell the FDA to Save Compounded Thyroid! Tell the FDA to Stop Harassing LDT Innovators! Tell the FDA to Stop Its Attack on Compounding! Tell the FDA to Stop Shielding Bad Science! Tell the FDA to Stop Trying to Censor Consumer Free Speech and Internet Searches! Tell the FDA to Warn Expecting Mothers about the Dangers of Acetaminophen! Tell the FDA to Warn Pregnant Women about Tylenol Dangers! Tell the FDA to Warn the Public about Sugar and Brain Injuries! Tell the FDA: "Natural" Food Is a Meaningless and Misleading Term! Tell the FDA: Add a Black Box Warning to SSRIs! Tell the FDA: Preserve the Small Farmer's Tester-Hagan Exemption! Tell the FDA: Study Vitamin D/Autism Link! Tell the FDA: Your Food Safety Rules Need Revising! Tell the FTC to Revise Its Consent Decree for Memory Supplement! Tell the FTC to Revise Its Consent Decree for an Omega-3 Memory Supplement! Tell the Federal Trade Commission to Reverse Its Dangerous Ruling! Tell the IRS to Keep Out of Politics! Tell the Institute of Medicine that Adverse Event Reports for Flu Shots Are Sending a Message They Need to Heed! Tell the International Trade Commission How Important Compounded 17P Is to Women! Tell the Media to Stop Their Smear Campaign! Tell the Media: Stop Ignoring the CDC's Data on HPV Vaccine Dangers! Tell the NOSB and the USDA to Protect Organic Foods! Tell the National Organic Board Consumer Opinion's Matter! Tell the National Organic Standards Board to Keep Organic Foods Pure! Tell the National Organic Standards Board to Stick by Their Commitment to Prohibit Streptomycin in Organic Apples and Pears in 2014! Tell the National Vaccine Program Office to Amend Its National Adult Immunization Plan! Tell the PCAC to Approve the Bulk Ingredient Nominations! Tell the Pediatricians and the CDC that the HPV Vaccine is Dangerous for Boys AND Girls! The American Academy of Pediatrics has followed the lead of the Centers for Disease Control and Prevention and is recommending the HPV vaccine for pre-pubescent boys. Tell the Senate HELP Committee: "Protect My Access to Compounded Medications!" Tell the Senate: "Don't Make GMO Labeling Voluntary!" Tell the Texas Legislative Oversight Committees and Gov. Rick Perry to Stop the TMB's Harassment of Dr. Burzynski! Tell the US Trade Representative that Trade Could be Increased if the EU Adopted US Standards for Supplements and Health Claims! Tell the USDA Not to Deregulate the Arctic Apple! Tell the USDA Not to Runaround a Court Order-- Keep Roundup Ready Sugar Beets on Hold! Tell the USDA and NOSB: We Need Real Organics! Tell the USDA and President Obama that Spraying More Chemicals on Poultry is NOT the Answer! Tell the USDA to Ban the Use of Fracking Water on Crops! Tell the USDA to Do Statistical Analyses for the Whole Story! Tell the USDA to ban the use of meat glue, and the FTC to stop allowing the lies about it on food labels! Tell the USDA: No "Trash Fish" in Kids' Lunches! Thank Chipotle for Listening to Their Customers! Thank Congress for Protecting CBD! Thank Congress for the New Compounding Provision! Thank House Committee Members for Taking a Stance on NDI! Thank Sen. Alexander and the Senate Appropriations Committee for Their Support! Thank These Senators for Supporting Free Speech about Health! 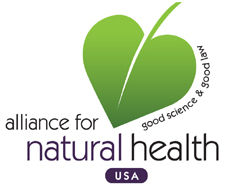 Tell Our Natural Health Champions "Thank You!" Tell Our Health Freedom Champions "Thank You!" Tell Our Natual Health Champions "Thank You!" Thank the House Ag Appropriations Committee for Their Charge to the FDA! Thank the Senators Who Supported the GMO Labeling Amendment! URGENT! Don't Allow the Biotech Industry and USDA to Override Court Rulings! URGENT: Tell Your Senators to Vote NO on S.959! USDA: Stop Ignoring GM Cross-Contamination! USDA: Stop Protecting Biotech Companies! Urge Your Congressperson to Co-sponsor the Compassionate Freedom of Choice Act! Urgent Action Alert! New Bill Says Doctor Can't Give You an IV Vitamin or Mineral if Not in Unrelated Drug! Veto the GMO Labeling Bill! Will FDA Censor the Cranberry?